(Nanowerk News) Using data gathered by NASA's Lunar Reconnaissance Orbiter (LRO) mission, scientists believe they have solved a mystery from one of the solar system's coldest regions—a permanently shadowed crater on the moon. They have explained how energetic particles penetrating lunar soil can create molecular hydrogen from water ice. The finding provides insight into how radiation can change the chemistry of water ice throughout the solar system. Space scientists from the University of New Hampshire and NASA's Goddard Space Flight Center have published their results online in the Journal of Geophysical Research (JGR): Planets ("The formation of molecular hydrogen from water ice in the lunar regolith by energetic charged particles"). Lead author of the paper is research scientist Andrew Jordan of the University of New Hampshire's Institute for the Study of Earth, Oceans, and Space (EOS). Discovering molecular hydrogen on the moon was a surprise result from NASA's Lunar Crater Observation Sensing Satellite (LCROSS) mission, which crash-landed the LCROSS satellite's spent Centaur rocket at 5,600 miles per hour into the Cabeus crater in the permanently shadowed region of the moon. These regions have never been exposed to sunlight and have remained at temperatures near absolute zero for billions of years, thus preserving the pristine nature of the lunar soil, or regolith. Instruments on board LCROSS trained on the resulting immense debris plume detected water vapor and water ice, the mission's hoped-for quarry, while LRO, already in orbit around the moon, saw molecular hydrogen—a surprise. "LRO's Lyman Alpha Mapping Project, or LAMP, detected the signature of molecular hydrogen, which was unexpected and unexplained," says Jordan. Jordan's JGR paper, "The formation of molecular hydrogen from water ice in the lunar regolith by energetic charged particles," quantifies an explanation of how molecular hydrogen, which is comprised of two hydrogen atoms and denoted chemically as H2, may be created below the moon's surface. "After the finding, there were a couple of ideas for how molecular hydrogen could be formed but none of them seemed to work for the conditions in the crater or with the rocket impact." Jordan says. "Our analysis shows that the galactic cosmic rays, which are charged particles energetic enough to penetrate below the lunar surface, can dissociate the water, H2O, into H2 through various potential pathways." That analysis was based on data gathered by the Cosmic Ray Telescope for the Effects of Radiation (CRaTER) instrument aboard the LRO spacecraft. Jordan is a member of the CRaTER scientific team, which is headed up by principal investigator Nathan Schwadron of EOS. Schwadron, a co-author on the JGR paper, was the first to suggest energetic particles as the possible mechanism for creating molecular hydrogen. 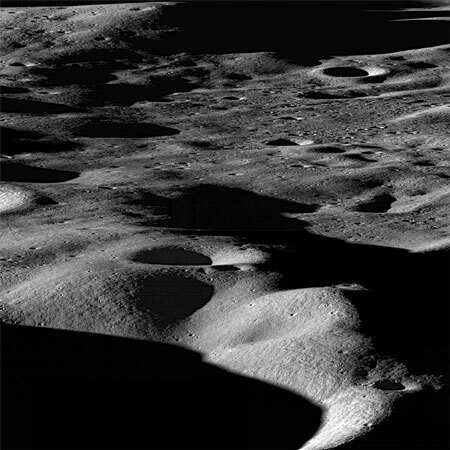 CRaTER characterizes the global lunar radiation environment by measuring radiation dose rates from galactic cosmic rays and solar energetic particles. Says Jordan, "We used the CRaTER measurements to get a handle on how much molecular hydrogen has been formed from the water ice via charged particles." Jordan's computer model incorporated the CRaTER data and showed that these energetic particles can form between 10 and 100 percent of the H2 measured by LAMP. The study notes that narrowing down that percent range requires particle accelerator experiments on water ice to more accurately gauge the number of chemical reactions that result per unit of energy deposited by cosmic rays and solar energetic particles.